QALA-E-KAZI, Afghanistan - Taliban militants on Wednesday released 12 of 19 South Korean captives they promised to free under a deal struck with the South Korean government to resolve a hostage crisis that began almost six weeks ago. The hostages were released into the care of officials of the International Committee of the Red Cross at three separate locations in central Afghanistan close to the city of Ghazni, according to an Associated Press reporter who witnessed the handovers. The first group of three women were released in the village of Qala-e-Kazi. Several hours later, four women and one man were released in a desert close to Shah Baz. The three women arrived in Qala-E-Kazi in a single car, their heads covered with red and green shawls. Red Cross officials quickly took the three to their vehicles before leaving for the office of the Afghan Red Crescent in Ghazni, witnesses said. As dusk approached, four more hostages were freed on a main road around 31 miles from Ghazni. The Taliban would free the remaining seven South Korean hostages in Afghanistan on Thursday, Xinhua News Agency quoted a local tribal elder engaged in talks as saying. In Seoul, South Korean Foreign Ministry spokesman Cho Hee-yong said the three, who he identified as Ahn Hye-jin, Lee Jung-ran and Han Ji-young, did not appear to have any health problems. To secure the release of the church workers, South Korea reaffirmed a pledge it made well before the hostage crisis began to withdraw its troops from Afghanistan by the end of this year. Seoul also said it would prevent South Korean Christian missionaries from working in the country, something it already promised to do. The Taliban apparently backed down on earlier demands for a prisoner exchange. The Taliban originally kidnapped 23 hostages as they traveled by bus from Kabul to the former Taliban stronghold of Kandahar on July 19. In late July, the militants executed two male hostages, and they released two women earlier this month. The insurgents have said they will free all the hostages, who they are holding in different locations, over the next few days. UN Secretary-General Ban Ki-moon, a former South Korean foreign minister, welcomed the news of a deal and called for all the hostages to be freed quickly. He said he used "all possible efforts" as secretary-general to help obtain the release of the hostages, talking to leaders in Afghanistan and the region who might have influence. "I welcome that news that both the Korean government and Taliban representatives have agreed to release the remaining 19 hostages," he said. The Tuesday deal was made in face-to-face talks between Taliban negotiators and South Korean diplomats in the central Afghan city of Ghazni. The Afghan government was not party to the negotiations, which were facilitated by the International Committee of the Red Cross. The South Korean government and relatives of the hostages have stressed that the South Koreans kidnapped in Afghanistan were not missionaries, but were doing aid work such as helping in hospitals. The Taliban had been demanding the release of militant prisoners in exchange for freeing the hostages. Afghan officials had ruled out any exchange, saying such a move would only encourage further abductions. Abductions have become a key insurgent tactic in recent months in trying to destabilize the country, targeting both Afghan officials and foreigners helping with reconstruction. 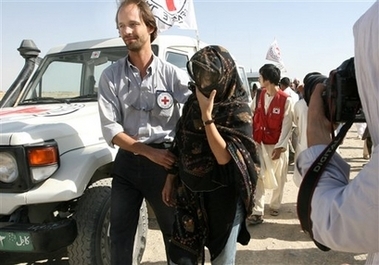 A German engineer and four Afghan colleagues kidnapped a day before the South Koreans are still being held. Elsewhere, US-led coalition and Afghan forces killed more than 100 suspected Taliban insurgents, and a suicide bomber blew himself next to an army patrol, killing two Afghan soldiers and four civilians, officials said. The insurgents were killed Tuesday in Kandahar province in southern Afghanistan after the joint force was ambushed by a large group of militants who tried to overrun their position, a statement from the coalition said. The force called in airstrikes, which killed more than 100 suspected insurgents, the coalition said late Tuesday. The casualty figures could not be independently verified because of the remoteness of the area. The clash left one Afghan soldier dead and three wounded. Three coalition soldiers were also wounded, it said. The nationality of the coalition soldiers was not disclosed, but the vast majority of foreign troops in the area are American.